Nobody likes to spend money needlessly, which is why after you invest in an automatic garage door system, you probably want to get the most out of it. That's where regular maintenance comes into play. Our technicians can perform a variety of tasks that will make sure every part of your overhead door stays fully operational and safe to use. Doing this on a regular basis will actually increase the lifespan of your door and reduce your need for costly repairs. That means you'll be able to save money in the long run. 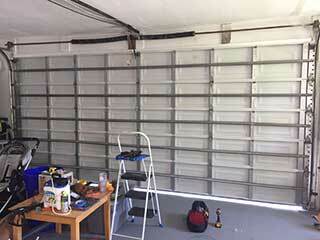 There are a lot of parts of your garage door that can accumulate damage over time. The more you use the system, the more wear and tear it incurs. The tracks and the rollers are particularly susceptible to various issues. The tracks can become bent, and may end up preventing the door from moving. The rollers can wear out or even break, and will have a similar hindering effect. A combination of both can lead to a scenario where the door gets off track. By examining these components and applying them with the right treatment (straightening and realigning the tracks, lubricating the rollers) we'll be able to prevent a lot of accidents and keep the door's movement smooth and efficient. These are perhaps the most important parts of your entire garage door system, as they are in charge of supporting the weight of the panels and providing them with the counterbalance measure that helps them rise and lower. Our technicians will inspect them for deformations, adjust their tension to alleviate their working stress as much as possible and lubricate them to keep their performance silent and efficient. Another key part of our regular garage door maintenance service is the opener. We'll make sure its motor gear and circuit board are in good shape, and we'll test the safety sensors and the auto-reverse function to ensure that the system is safe to use. Anything that's found to be lacking will be repaired or replaced on the spot. Reach out to Garage Door Repair Alpine today and schedule a maintenance appointment that will have your system working better than ever.